If you are in Dubai and looking to savour a Thai cuisine buffet, then stopover at The Chill restaurant within Dusit Princess City Centre in Deira district. This wonderful restaurant provides you a superb service along with delicious and traditional Thai dishes, which will take you far away from this Arab country. It’s the strong aroma and luscious sights of the Thai food at this bistro, which creates this magic and make you feel, as you are ever ready to gulp down this bistro’s appetizing food. Apart from first class service and food, the Chill restaurant is economical as well as buffet and individual dishes are priced reasonably. Thai food buffet is the speciality of the Chill at Dusit Princess City Centre, as the food is great in taste and this all you can eat deal is also reasonably priced therefore it drags lot of Thai cuisine lovers to this site, who love to savour food in quantity. Salads, prawns and other seafood items can be found on the menu of the Chill restaurant along with buffet items and desserts, which also includes some Arabic delights. Guests can walk into this restaurant to relish breakfast and lunch between 6:30 am and 3:00 pm daily, while the dinner orders are taken from 6:00 pm onwards till 11:00 pm. 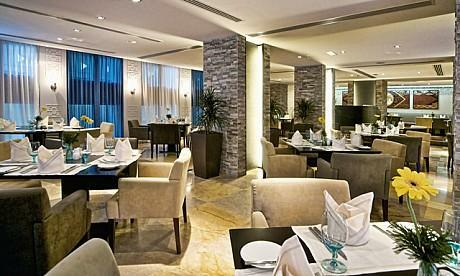 Dusit Princess City Centre Dubai Hotel, Le Meridien Fairway, 35th St - Dubai - United Arab Emirates. Emirates Metro Station 2 and The Chill restaurant in Dusit Princess City Centre are adjacent to each other. Therefore, all commuters need to do after getting out of this metro station is to head in the east direction and within no time they will be inside this complex, where this restaurant is located. Head southwest from Emirates Metro Station 1 – Dubai and then turn right soon you will find the Dusit Princess City Centre in front of your eyes. See the map for directions.